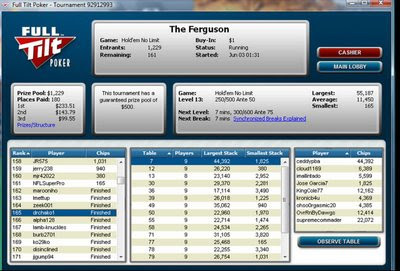 Perhaps I should have said, "In the money in a tournament with the most number of entrants in my online poker career," but that wouldn't fit as a title. Okay, so it was only $1.60, but it's a cash in a tournament with over 1000 entrants, darn it. And this after playing 10 games of racquetball! Allow me to bask in my moment of glory, please. A bunch of us at Texas Tech tried to play 4 games of racquetball in one afternoon. We had booked courts for 4 consecutive hours. We survived the games, but found we couldn't walk up the stairs back to our rooms in the dorm. You played 10? 10? I give you a 10! The statue is out due to current economic conditions. The committee will now retire to the bar for refreshments as soon as we can grab Doc's credit card. Damn The Wife grabbed it to go buy shoes to celebrate his win. I'm a Squash man myself. There's something to be said for required skill at the speed of Raquetball of course, but I equate it to winning coin flips in Poker. Shouldn't the wife have to buy you a Ferrari now? I'm usually ready for nap after game 3 of racquetball. woot, a ca$h is a ca$h.